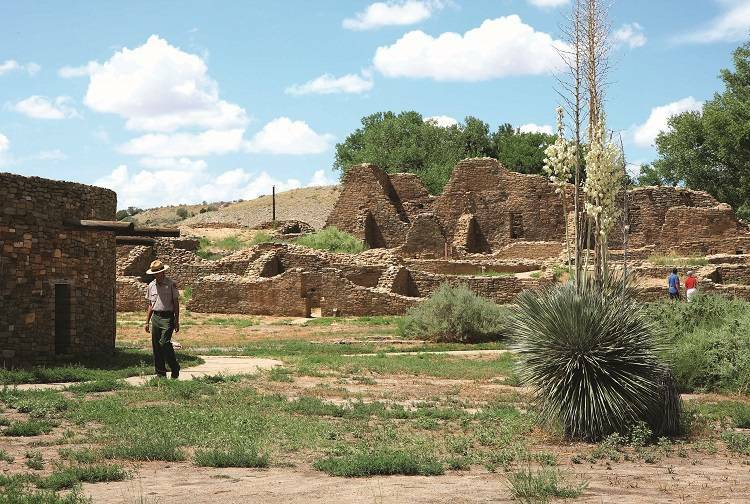 Aztec Ruins National Monument provides visitors an intimate opportunity to explore ancient ruins built by the ancient Ancestral Puebloans in the 1100s. Aztec Ruins features ceremonial, public, and storage structures as well as the "Great Kiva" the oldest and largest reconstructed Kiva in North America. Take a self-guided tour through the complex and explore the structures of an ancient people. You will walk through the rooms and kivas built by the ancient Ancestral Puebloan people. Aztec Ruins National Monument is widely known for the Great Kiva. The Great Kiva is a 40-foot diameter semi-subterranean structure which was the central religious site of the complex. Today it is the largest reconstructed Kiva in the United States. Total distance of the self-guided trail is approximately half a mile. Located 14 miles east of Farmington on Main Street, Highway 516, towards Aztec, NM. Turn left onto Ruins Road just before you cross the river (if you cross the river, you've gone too far). Follow Ruins Road directly to the monument entrance. Farmington CVB videos also available in HD on YouTube.